While on your Windows desktop, you can join a support session using the Support URL or Support Key provided by your agent in various ways. However, your experience joining the support session will depend on whether the GoToAssist Opener "helper" application has been installed previously. Joining from a Mac? Check out the Customer Guide for Mac. If it's your first time joining a session, you will be prompted to download the GoToAssist Opener "helper" application. Once installed, the GoToAssist Customer application will launch, and you will be joined with the agent in a support session. 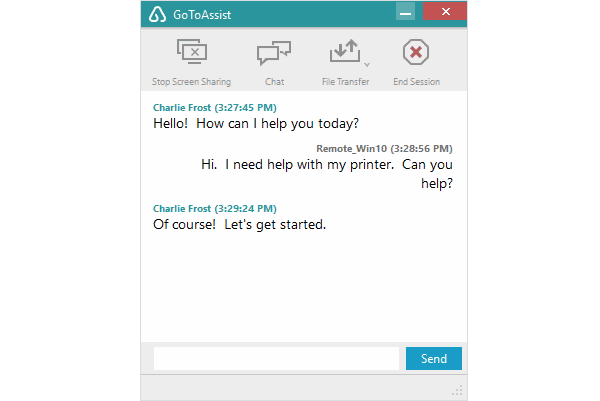 If you've joined a session before and have previously installed the GoToAssist Opener "helper" application, the GoToAssist Customer application will launch you directly into a support session with the agent. Note: If prompted by the User Account Control (UAC) setting, click Yes to continue. Enter your name and Support Key. Click Continue to download and run the "helper" application, or be launched immediately into session. Click the Support URL in the email invitation. When your web browser opens, you will either be prompted to download and run the "helper" application, or be launched immediately into session. The GoToAssist Customer standalone app for Windows is a single executable (.exe) file that you can download and use to easily join support sessions. Learn more. Click on the downloaded file, then click Run to open it. Enter your name and Support Key, then click OK to launch the GoToAssist Customer app and join the support session. Note: To easily access the GoToAssist Customer Attended app from your desktop, locate the "G2A-RS Customer Attended App" in your "Downloads" folder, right-click on the file, then click Create shortcut. What are the system requirements for joining a session? System requirements for the customer desktop application can be found here. Where can I find information about optimal firewall configuration? All firewall configuration information can be found here. Once you have joined a support session, you are prompted to share your screen with the agent and allow them to remotely control your keyboard and mouse. You can click Stop Screen Sharing on the GoToAssist Customer toolbar to stop screen sharing and remote control at any time. Note: When an agent's account is enabled for session recording, an additional message, "This session will be recorded" is displayed when you are prompted to join the support session. I stopped sharing my screen. How do I start sharing it again? The agent must send a screen sharing request, and you can click Yes on the prompt to begin sharing your screen again. I have multiple monitors. Can the agent see all of my screens? Yes. Multiple monitors are supported when you share your screen with the agent. Why doesn't the agent have remote control during my session? 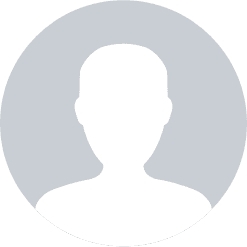 The remote control feature is dependent upon the agent's user group settings or individual user settings, which are configured by their administrator. I see a message that the session will be recorded. What exactly will be recorded? If an agent's account is enabled for session recording, all screen sharing activity that occurs during your session will be recorded. If the agent shares their screen with you, this activity is also recorded. During your support session, you can send files to the agent, and they can send files to you. Note: If prompted by User Account Control, click Yes to proceed with the file transfer. You will only be prompted once during your session. Click File Transfer on the GoToAssist Customer toolbar. Click Send Files to <agent name>. Select 1 or more files or folders (hold the Ctrl key to select multiple). When the agent sends you a file, an Incoming File Transfer window will appear, with the default destination location of Documents. Click Save to save the file in the default destination, or click Change to browse to a different destination location, then Save. When the agent requests a file from you, a File(s)/Folder(s) Selection window will appear. 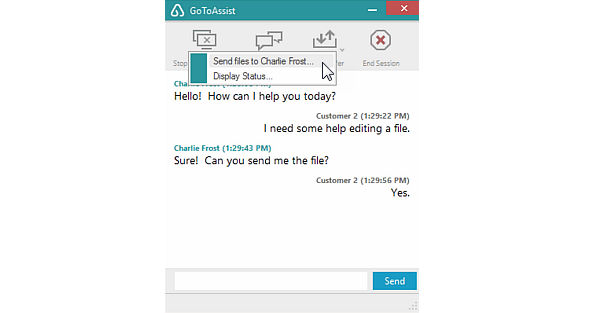 You can use the chat feature on the GoToAssist Customer toolbar to send & receive chat messages during your support session with the agent. When you join, the GoToAssist Customer toolbar will be minimized. Click Chat to expand the chat window, where you can exchange messages with the agent during your support session.